Buy a Christmas card for £3 and get a coffee voucher inside. Is it a £3 gift card plus a free coffee or is it £3 for a xmas card and a free coffee? £3 for a Christmas card and inside the card is a free coffee voucher. Is it a £3 gift card plus a free coffee or is it £3 for a xmas card and a f …Is it a £3 gift card plus a free coffee or is it £3 for a xmas card and a free coffee? 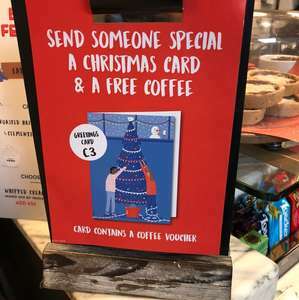 £3 for a xmas card and a free coffee? I also spotted a gift card offer instore recently; if you buy a gift card and top it up with £25 or more they will add a free £5 on top of it. The offer is on for another week or two I think. Will check when I go get my free O2 coffee soon. I also spotted a gift card offer instore recently; if you buy a gift card …I also spotted a gift card offer instore recently; if you buy a gift card and top it up with £25 or more they will add a free £5 on top of it. The offer is on for another week or two I think. Will check when I go get my free O2 coffee soon. Just back from Nero, the gift card offer is valid until the 10th Dec.
Is there an expiry date on the voucher? ‌ yep clever though to draw people in. Is this a tax scheme? Cards and stuff are vat exempt I believe, so by paying for a card rather than a coffee they save something like 60p. Or am I just being a sceptic? I love Caffe Nero but £3 for a Christmas card ? They were 50p for a decent 10 pack in Card Factory in last years sales.